This recipe is tried and true for me. I cut it out of Taste of Home many moons ago. Spray a shallow roasting pan with cooking spray 3 times to coat well; set aside. Mix first 6 ingredients in a large ziplock bag. Cut any large potatoes into halves or quarters so all potatoes are roughly the same size. Pierce each with a fork. Shake potatoes in mustard mixture to coat. Place in prepared pan. Bake, uncovered, at 375 for 30-40 minutes until tender. In a shallow bowl, beat egg whites until foamy. In another shallow bowl, combine the flour, bread crumbs, Parmesan cheese and seasonings. Cut each potato lengthwise into 8 wedges. Dip potatoes in egg whites, then coat with crumb mixture. Place in a single layer on a baking sheet coated with nonstick cooking spray. Spray wedges evenly with nonstick cooking spray. (Whoa. Just hold it right there. Coat the potatoes with Pam?! I imagine drizzling them with olive oil would also work.) Bake, uncovered, at 375 for 40-45 minutes or until golden brown. 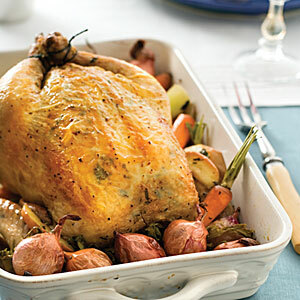 I never roasted a chicken until I tore this article out of Health magazine in 2007. By Peggy Knickerbocker. When you get your bird home, unwrap and rinse it inside and out with cold water. Pat it dry with paper towels. Sprinkle it all over with 1 tsp kosher salt. 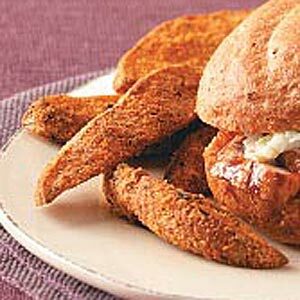 The salt makes the meat tender and enhances the flavor (and doesn’t make it salty). Cover with plastic wrap, and refrigerate until ready to roast (up to 1 day). Bring the bird to room temperature an hour before roasting; then put the fresh rosemary and garlic in the cavity. Sprinkle chicken with black pepper. Heat oven to 450. On the stovetop, preheat a cast-iron skillet large enough to hold the chicken over medium-high heat. (I just wrap the handle of a heavy duty skillet in foil.) Add olive oil to the pan, and place the bird, breast side up, in the pan. Then place the hot skillet on the middle rack of the oven. (For an easy side, toss new potatoes or red creamer potatoes in a little olive oil and add them to the skillet after about 20 minutes.) Roast about 1 hour for a 3.5 lb bird and up to 90 minutes for a 5-pounder. After about 50 minutes, use a meat thermometer to check the temperature in the thickest part of the thigh; it should reach 180. Two other quick tests for doneness: Wiggle a chicken leg; if it’s loose, it’s done. Or cut into the crease where the thigh meets the body; if there are no signs of blood and the juices are clear the bird is done. If it’s not done, continue to roast another 10 minutes or so. Put the chicken on a cutting board with a lip so the juices won’t overflow, and let it stand 10-15 minutes. Then sprinkle additional black pepper over the top and carve, starting by removing the thighs and legs and then the wings. For the breast, carve from the outside to the inside, in thin even slices. 1. Heat oven to 350. 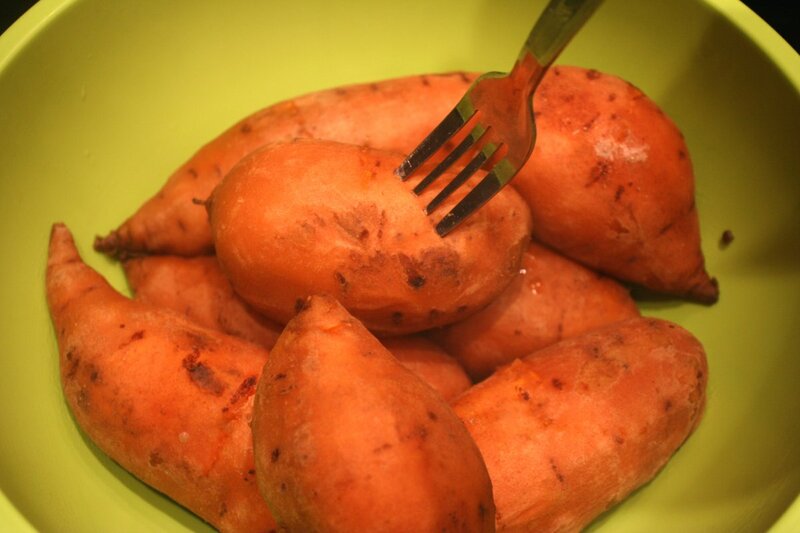 Pierce each potato 2 times with a fork. Microwave potatoes on high 5-10 minutes or until tender, turning potatoes over 1/2 way through cooking. Let stand 5 minutes or until cool enough to handle. 2. Remove skin from potatoes. Place potatoes, brown sugar, cream, butter, vanilla, and pumpkin pie spice in a large bowl. Beat with a mixer until smooth and fluffy. Transfer mixture to a greased 13×9 or 3-quart baking dish. Top with marshmallows. 3. For streusel, mix flour, brown sugar, and pumpkin pie spice in a medium bowl. Cut in butter with a pastry blender or fork until crumbly. Stir in pecans and coconut; sprinkle over marshmallows and whipped sweet potatoes. 4. Bake, uncovered, 25 minutes or until heated through and topping is golden brown. 1. Heat oven to 475. Finely chop garlic, and sprinkle with salt. Using a chef’s knife, press flat side of blade back and forth across garlic to make a paste. Transfer to a small bowl; stir in thyme and 1 T oil. 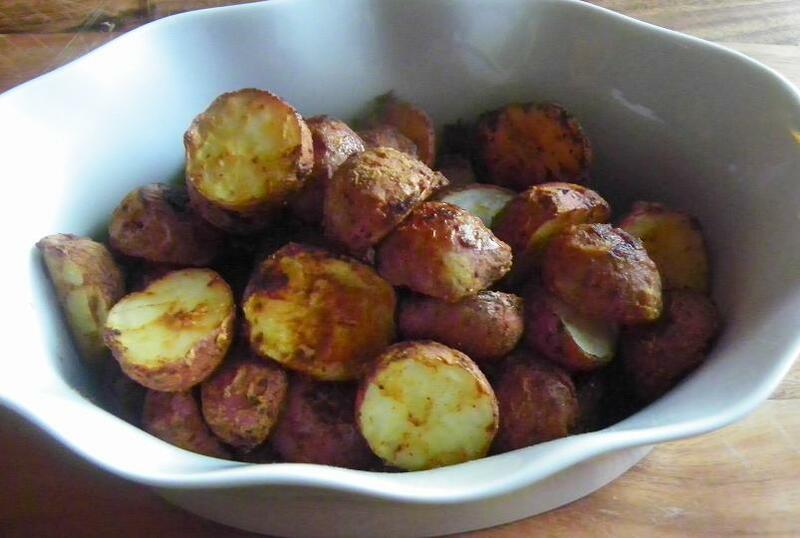 On a large rimmed baking sheet, toss potatoes with garlic mixture; bake until browned on underside, 20-25 minutes. 2. Meanwhile, heat a large skillet or grill pan over high. Season steaks with s & p, and cook (in two batches if necessary) until medium-rare, 3-6 minutes per side (depending on thickness of steak). Transfer to a plate to rest. 3. 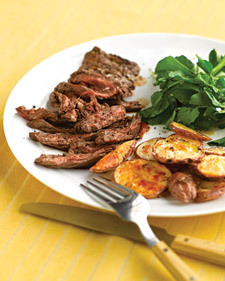 Serve steaks with potatoes & a salad. My mother-in-law makes these often and Mike really likes them. Easy, too! 6 cups veggies, such as red onion, potatoes, bell peppers, zucchini, broccoli, sweet potatoes, chunks of corn on the cob–whatever you like! *It is best to partially cook any potatoes in the microwave first. Otherwise they don’t get done. 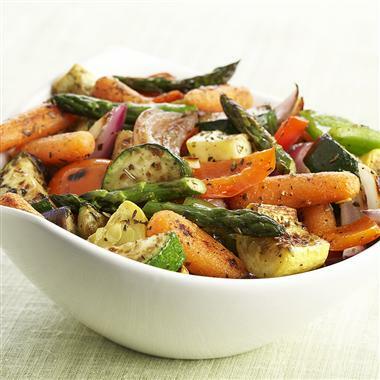 Put veggies in a large bowl. Mix oil and spices. Pour over veggies & toss. Spread in a 9 x 13″ pan. Roast at 450 for 25-30 minutes. You can serve like this, or you can stir in 2 cups chopped Portobello mushrooms, sprinkle 2 cups shredded mozzarella cheese and bake 5 more minutes. I tore this out of a Rachael Ray magazine. 1. Heat a deep skillet or a wide 4-6 quart pot over med-high heat. Add the kielbasa and cook, stirring, until lightly browned, about 6 minutes. Transfer to a plate. 2. Add the onions and butter to the pan and cook over medium heat, stirring occasionally, until golden, about 6 minutes. Add the broth and potato and bring to a boil. Reduce the heat, cover with a lid and simmer until the potato is tender, about 10 minutes. Add the half-and-half and corn and cook, stirring, until heated through. 3. 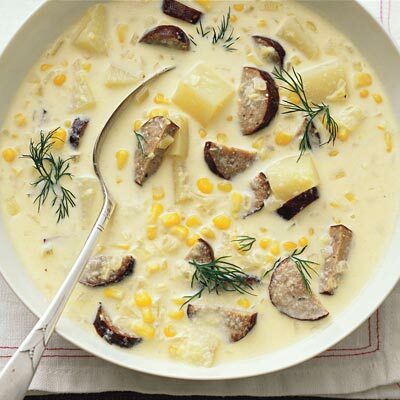 Using a blender or food processor, puree 1 cup chowder until smooth. Stir the puree back into the chowder along with the browned kielbasa and season to taste with s & p. Top with the dill. And sometimes I cook. · One woman's mission to trash her cluttered cookbook.